The Sony Vaio Duo 11 and many other touchscreen laptops, which utilize the new touch-oriented operating system from Microsoft, had their debut at the IFA in summer 2012. What set it apart from other flipping, twisting and dockable devices is its unique slider form factor and strong performance due to high-end hardware which is comparable with the best Ultrabooks in the market. This also means that the Vaio Duo 11 unlike e.g., Windows RT systems, which can run only a limited apps from the Windows market, can run all PC software build for the x86 architecture. Other advantages of the Duo 11 include all full size ports like VGA, HDMI, Ethernet and USB, which are mandatory for business user when on-the-move. In addition, its bright and contrast-rich FullHD screen is the best of its kind, and its premium case composed of a massive magnesium parts make the Duo 11 very sturdy and durable. However, every design has some trade-offs, and the Duo 11 is no exception. Intel’s i5 architecture require much more power than the ARM architecture, so the battery life of the Duo 11 barely meets the general Ultrabook requirement. 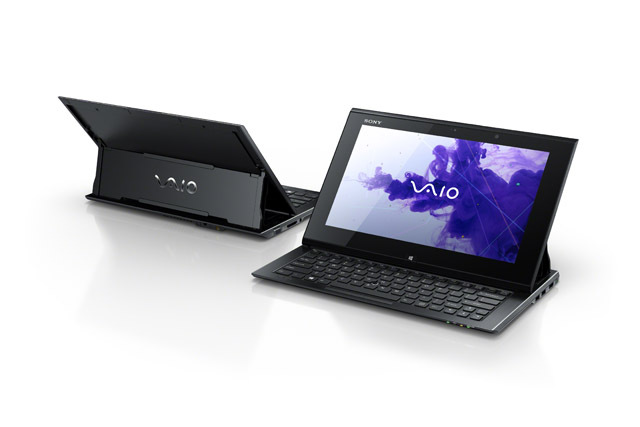 Due to full size ports and keyboard, the Vaio Duo 11 is heavy and it is very hard to use as a stand-alone tablet. Due to the small form factor and the slider mechanism, the Vaio Duo 11 also falls behind standard Ultrabooks when it comes to user comfort. Because of its disadvantages, the Vaio Duo 11 is not suited for average consumers. However, it is one of the best candidates for business users who want powerful performance and convenience on-the-go. 80.67%: This rating should be considered to be average. This is because the proportion of notebooks which have a higher rating is approximately equal to the proportion which have a lower rating.